If you don't use a crafting bench than you won't have any tools. It's impossible! Did you read the thread AT ALL? Oh gosh. You HAVE to destroy the enderdragon's health generation thingys,otherwise it would be impossible. The health generators,basically explodes after destroyed,which can almost kill you,since you would take fall damage. If it takes forever to kill a creeper with your bare hands,try killing a mob with ONE HUNDRED hearts,and takes half of your life bar. Oh boy,this is going to be totally not hard,huh? If boredom counts as a challenge, this will be really hard. Awesome idea though, some of the solutions you wrote are really creative. Still, all the mining with my bare hands sadly makes me decline this. I said to use 100% vanilla. That's right, you could get obsidian from villages! I'll add this as a third way to build the frame. Also, you can get iron ingots as rare drops from zombies. How did you get the snowballs without a shovel, maybe I skipped over it by accident. Anyways, nice challenge I'll try it today. Also, zombies can drop iron shovels as rare drops. Don't forget zombies can drop iron swords as rare drops, and skeletons can drop bows as rare drops. Skeletons can also drop arrows. Arrows and snowballs can be used to destroy the crystals. It's only been one day and night, and I'm already at the risk of dying. Then, when daylight came, the zombies gave up on that house, and decided to come to mine! 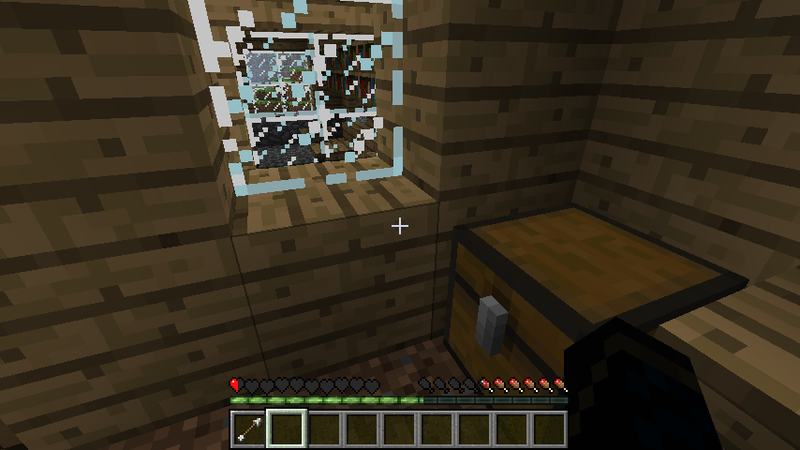 I looked back at the window to see if it was the same creeper, but that one was still there. 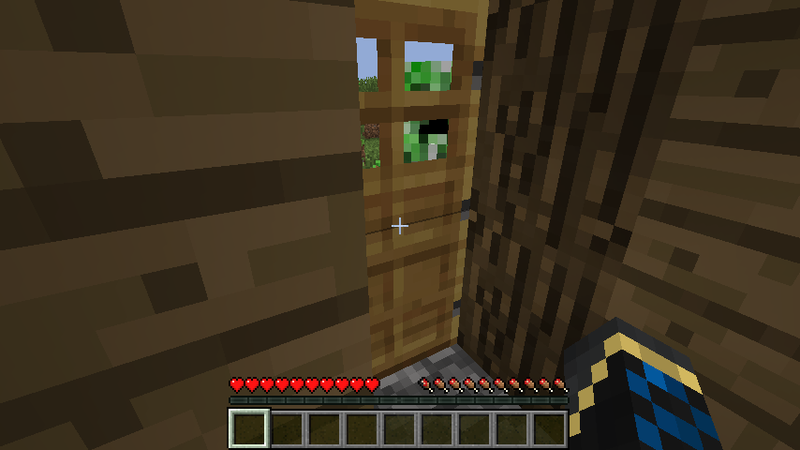 So, there is a creeper in front of my window and in front of the door. I have no idea how I'll make it out of there alive. 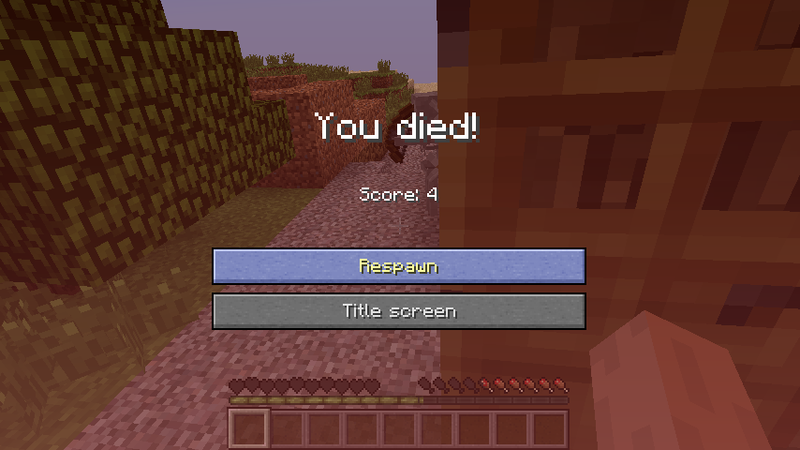 This time, I actually did die, but not by a creeper. This would cause a lot of trouble later. 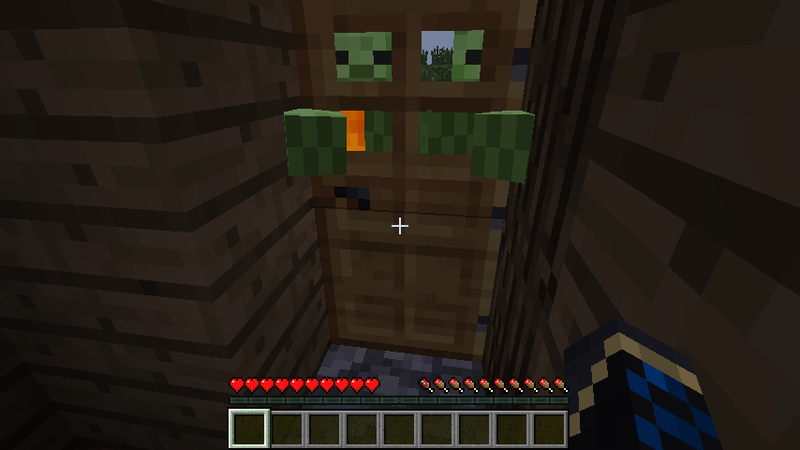 The librarian was in a house next door, and I noticed a zombie in front of his door. 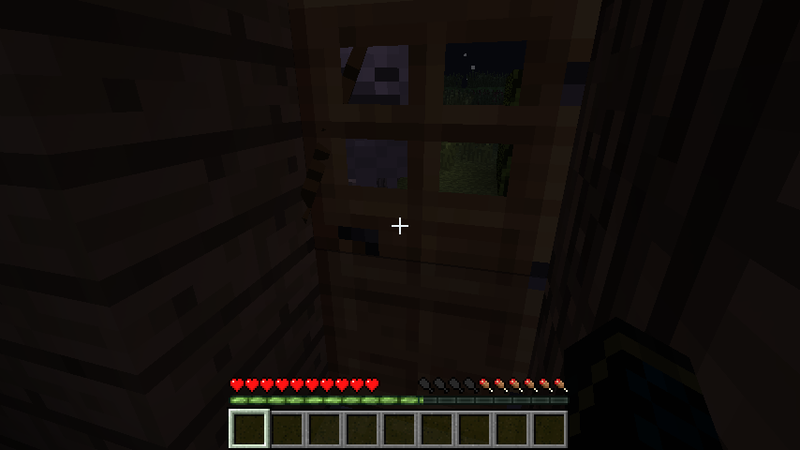 When daytime came, that villager opened the door! He was immediately killed by the zombie, and I realized what happened to all the other villagers, and why the zombies the day before came after me when night ended. The zombie and skeleton left in search of shade, so I went outside. Unfortunately, two skeletons were waiting, protected by a roof and a house, and I barely managed to escape. I went outside again, and immediately died. 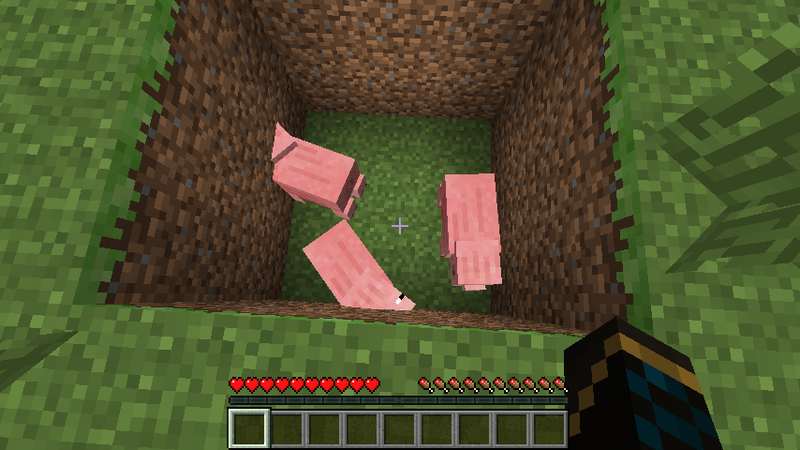 When I returned to the village, the monsters had despawned, so I spent the rest of the day building a hole, luring pigs with wheat from the farm, then pushing the pigs into the hole. The next day, there were curiously no monsters. I spent that day gathering wood, cooking them in the blacksmith to get charcoal, then making torches. 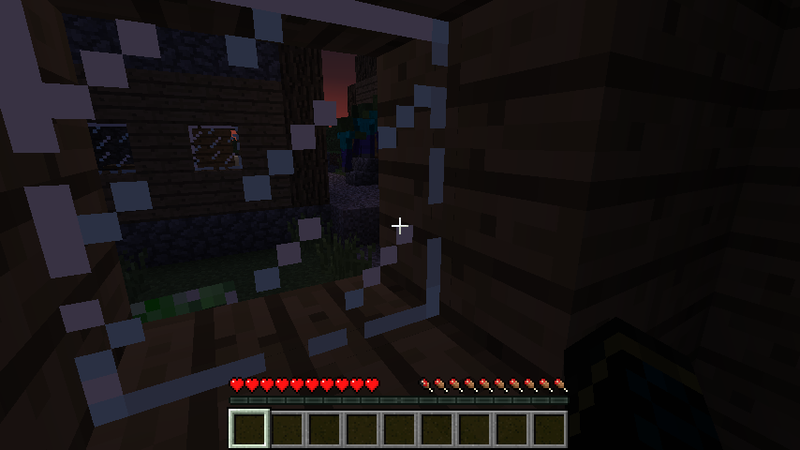 I scattered 16 torches around the village. Rare drops only appear when the mob is killed by a player, so the traps wouldn't work. I like you idea with the 1-block hole in the dungeon wall, though. That will really help. I am TOTALLY going to try this. Later. =P I'll make a Lets Play series, so... yeah. Just gotta get FRAPS or something like it. Once I've got that, though, TOTALLY doing this. Ok, I started. Here's me standing with my beautiful lucario girlfriend, lucaria (using the simple NPCs mod) and we're ready to survive. WWell Lucaria and I have to go to sleep now that it's midnight (IRL!!!) so goodnight all. This has to be one of the retarded things I have read on this forum. That's saying a lot. Well, I won't stop you from using mods like this, though you won't get the full satisfaction. Glad you're trying the challenge! Just curious, where did you get the beds and glowstone? Added achievements, though I don't really expect anyone to do them. 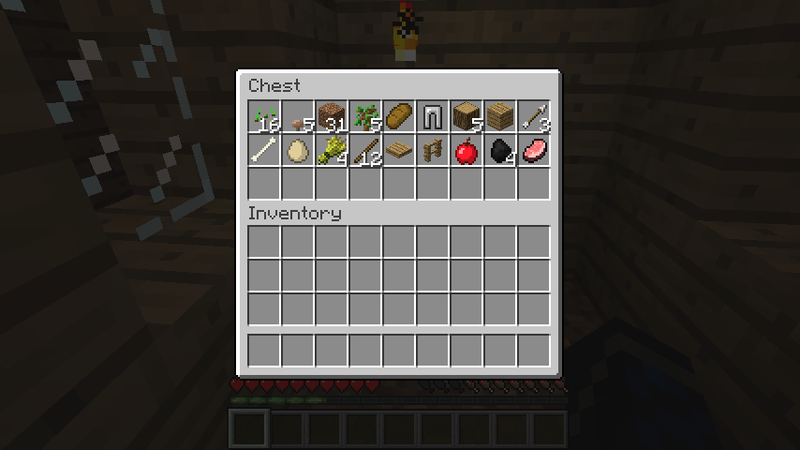 Apples would be the only way to really get food since you cant make a furnace to smelt things in. This sounds fun though! I'll probably make a youtube video of this. Great idea! Also, you can smelt using npc village furnaces (which aren't really needed for food; just makes them heal more food points). Or you could use npc village farms to get wheat to breed animals. rotten flesh, spider eyes, raw food, golden apples found in chests, etc. all can be used for food. I will try to do regular updates on this challenge. I will probably use a seed though.